Obama picks Bible for inauguration, but what verse? (CNN) -- While President-elect Barack Obama will certainly be making history when he takes the oath of office on January 20, he'll also be repeating it -- by placing his hand on the same Bible that Abraham Lincoln used during the inauguration of 1861. 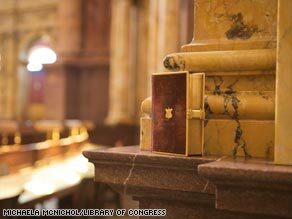 The Constitution does not require presidents to be sworn in on a Bible, though almost every chief executive since George Washington has chosen to do so. Presidents have differed greatly, however, on the question of which passage the Bible should be opened to during the swearing-in ceremony. It brings up the question of what -- if any -- biblical passage Obama will emphasize. If what is past is prologue, as Shakespeare famously wrote (a quote now engraved in front of the National Archives), he might opt for the popular presidential theme of repentance. According to Gleaves Whitney, a presidential historian at Michigan's Grand Valley State University, II Chronicles 7:14 was used for three swearing-in ceremonies: "If my people, who are called by my name, will humble themselves and pray and seek my face and turn from their wicked ways, then will I hear from heaven and will forgive their sin and will heal their land." In this season of economic distress, however, the president-elect may prefer to follow the lead of Franklin Roosevelt. When FDR first took the oath of office in 1933, the country was reeling under the crushing weight of the Great Depression. "Only a foolish optimist can deny the dark realities of the moment," Roosevelt said in his inaugural address. Urging his fellow Americans to lend a helping hand, Roosevelt had the Bible opened to I Corinthians 13: "And now abideth faith, hope, charity, these three; but the greatest of these is charity." Obama campaigned as someone who would strive to bridge the nation's bitter partisan divide. "We have never been a collection of red states and blue states," Obama said in his Election Night victory speech. "We are, and always will be, the United States of America." If Obama wants to stress that theme again on January 20, he may prefer to follow Bill Clinton's lead from the 1997 inaugural and open the Bible to Isaiah 58:12: "Thou shalt raise up the foundations of many generations, and thou shalt be called the repairer of the breach." Questions of war and peace are always in the back of any president's mind. Obama campaigned in part on a promise to end America's war in Iraq. Shortly after winning the White House on a similar pledge to end another divisive conflict -- this one in Vietnam -- Richard Nixon took the oath with a family Bible opened to Isaiah 2:4: "And he shall judge among the nations, and shall rebuke many people: and they shall beat their swords into plowshares, and their spears into pruninghooks: Nation shall not lift up sword against nation, neither shall they learn war any more." With the polls showing an overwhelming majority of Americans convinced the country is on the wrong track, Obama might hint at a back-to-basics message by doing what Woodrow Wilson did in 1913. During his first inaugural, Wilson opened the Bible to Psalm 119, which concludes "I have gone astray like a lost sheep; seek thy servant; for I do not forget thy commandments." Speaking of a return to basics, what about America's first president? What did George Washington do? Almost 220 years ago, in 1789, Washington opened the King James version of a Masonic Bible to Genesis 49:13 -- "Zebulun shall dwell at the haven of the sea; and he shall be for a haven of ships; and his border shall be unto Zidon." Was America's first president trying to send a deep, profound message? Not exactly. It turns out that, for the nation's first inaugural, the Bible was hastily opened to a completely random page. The same thing was done 72 years later when Lincoln was sworn in. CNN's Brendan Polmer contributed to this report.